Fill your plates with the belly-filling warmth and delight you can't find anywhere else. As robust in beef flavor as they are lean, our tri-tip and top sirloin steaks are sure to be a hit. 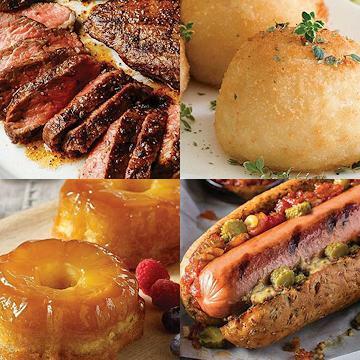 Complete your feast with grill-ready gourmet burgers and jumbo franks, perfectly browned Potatoes au Gratin, and the nostalgic sweetness of our individual Pineapple Upside-Down Cakes. Order today to enjoy a premium, gourmet meal as satisfying as the price! Thaw in Refrigerator. Remove burgers from packaging while still frozen.Grill or Broil: Thaw burgers. Grill or broil for 5-6 minutes per side until internal temperature reads 160�F. Overcooking can result in a dry product. Contact Grill: Grill for a total of 5-6 minutes until internal temperature reaches 160�F. It's easiest to remove burgers from the wrap while still frozen! Pan Fry: Preheat a small amount of cooking oil in non-stick pan over medium heat. Add burgers, pan frying for 6-8 minutes on each side or until internal temperature reaches 160�F. Boil: From Frozen or thawed, boil franks for 8-10 minutes. Grill: Grill franks over medium heat until brown on all sides. Frozen franks will cook in approximately 15 minutes. Thawed franks will cook in approximately 8 minutes. Microwave: Place frank on a microwave safe plate. Cover with paper towel. For one frank, cook on high for 1 � -2 minutes, if frozen and 1 minute if thawed. Ingredients: Pork, Beef, Water, Nonfat Dry Milk, Salt, Corn Syrup, Sodium Lactate, Natural Spices, Dextrose, Flavorings, Sodium Diacetate, Paprika, Monosodium Glutamate, Sodium Erythorbate, Sodium Nitrite. Contains: Milk. .